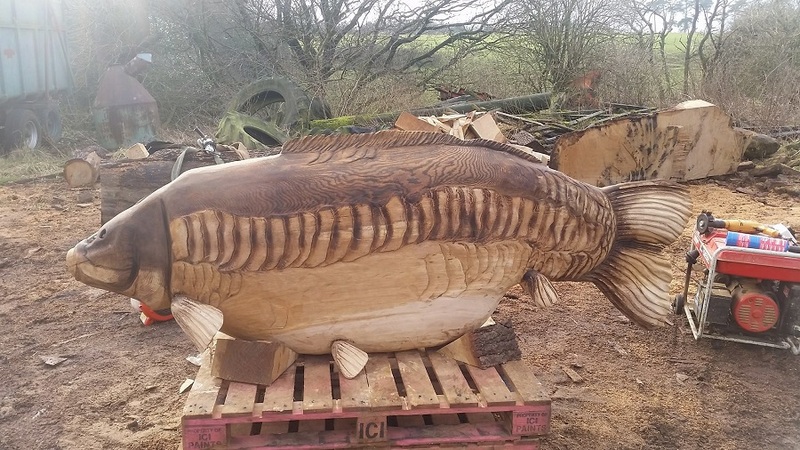 A 7ft-long half-ton carp carved from solid oak is set to welcome anglers to a fishery. The incredible sculpture took a week to fashion from English timber and is the work of woodcarver Karl Barker. It was commissioned by Rich Paull who runs the Fishermen’s Retreat carp venue in France. Rich has nicknamed it 'the Carp Deity' and told Carpfeed it is based on a real fish. He said: “To add to the ‘wow factor’ of Fishermen’s Retreat I wanted to finish it off with a special welcome piece. “There's been a favourite fish of mine, named Crosby, which has been elusive over the years. Woodcarver Karl told Carpfeed: “This piece took about a week to carve as details needed to be discussed with the client regarding specific features as the carving progressed. “The main body is one solid piece of English oak, and the oak fins have been attached. Rich, who opened Fishermen’s Retreat in 2016 and recently undertook desilting work, added: “I communicated with Karl step by step to achieve the amazing piece, tweaking the carving here and there until we were both happy with the end product. More of Karl's work can be seen here. For more on Fishermen's Retreat, visit here.